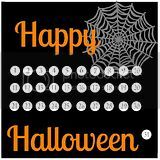 Beckie from Infarrantly Creative is at it again with this creative way to countdown to Halloween! The numbers are inverted Hershey Kisses that you pull off each day as you count down. You will receive a .pdf file emailed to you with the numbers on them for you to print and cut (we recommend a 3/4 inch paper punch to make that process easier). If you prefer, you can also order vinyl stickers that you can just stick directly to the back of the kisses. They are listed HERE. The color selection at checkout is for the words. If you prefer a different color web than the silver that is pictured, please specify that in the comments section at checkout.